For the monument in Kansas City, see Liberty Memorial. Liberty was settled in 1822, and shortly later became the county seat of Clay County. The city was named for the American concept of liberty. The Arthur-Leonard Historic District, Clay County Savings Association Building, Clinton House, Dougherty-Prospect Heights Historic District, Garrison School Historic District, Frank Hughes Memorial Library, IOOF Liberty Lodge No. 49, Jewell Hall, Jewell-Lightburne Historic District, Major Hotel, Miller Building, Mt. Memorial Cemetery, Nebo Hill Archeological Site, Odd Fellows Home District, South Liberty Courthouse Square Historic District, and West Liberty Courthouse Square Historic District are listed on the National Register of Historic Places. Liberty is located at (39.240852, -94.426502). According to the United States Census Bureau, the city has a total area of 29.15 square miles (75.50 km2), of which, 29.03 square miles (75.19 km2) is land and 0.12 square miles (0.31 km2) is water. As of the census of 2010, there were 29,149 people, 10,582 households, and 7,555 families residing in the city. The population density was 1,004.1 inhabitants per square mile (387.7/km2). There were 11,284 housing units at an average density of 388.7 per square mile (150.1/km2). The racial makeup of the city was 91.4% White, 3.6% African American, 0.5% Native American, 1.0% Asian, 0.1% Pacific Islander, 0.9% from other races, and 2.6% from two or more races. Hispanic or Latino of any race were 4.1% of the population. 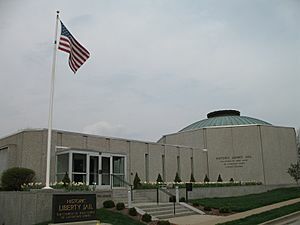 The Liberty Jail is now an open museum and tourist site. 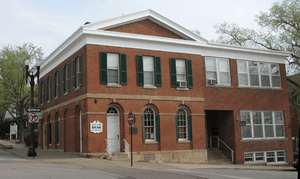 The Clay County Historical Society Museum features period room displays, a historic pharmacy ounter, toys and dolls, model trains, tools and more. 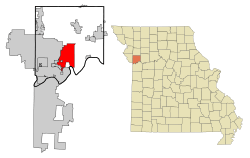 Liberty, Missouri Facts for Kids. Kiddle Encyclopedia.